Do you also feel selling globally sometimes brings more loss than profit? Do you end up putting too many efforts in managing your international business and not getting much output from it? But in the end you know that if you want to make it big in e-commerce, you have to go global. Gone are the days when e-commerce businesses benefited within local ranges. Today, if you are selling online, you will most probably do better with selling it globally. One of the prominent reasons for you to go out of country boundaries is- if you have a wider range of potential buyers, you will undoubtedly sell more. Selling globally means working on an entirely different range of challenges. Let’s see what challenges exactly you could face. YOU NEED MULTIPLE STORES FOR DIFFERENT COUNTRIES. SHIPPING RATES VARY WITH COUNTRIES. TAX RATES VARY WITH COUNTRIES. YOU NEED TO TAKE CARE IF WHAT YOU ARE SELLING IS NOT BANNED IN ANY COUNTRY. YOU NEED TO MANAGE MULTI-WAREHOUSES FOR ALL THE COUNTRIES YOU SELL IN. Now you might feel that growing global business is a farfetched dream. But, it is simple. We have taken care of all your concerns and have come up with an ultimate solution- Multi Country Pricing App. You can set different prices for the same product any number of times in any number of countries. It provides you to set different prices for same product in one single store. It is convenient and hassle-free to use. A very helpful team of experts helps you with any concern related to app or your Shopify store in general. The ultimate goal of the app is to Increase your profit margin and to Help you manage different prices for same product with a breeze. Do you think the only solution to sell successfully in various countries is by setting online stores for all those countries? If you do think it is, you are not wrong. However, you still need to consider all the issues that come with this solution. You have to host multiple stores online, which means more money spent. In addition, for managing these stores, you need a bigger team. Maintenance cost increases by a big number. Data Synchronization is a big issue when managing various stores. You constantly need to keep the entire team updated of the orders and sales made. You need to manage inventories for all the stores and need to take care of providing buyers with proper information. 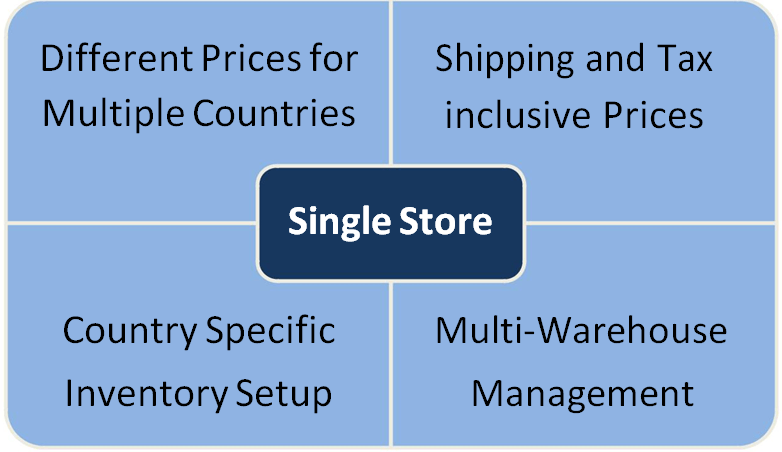 One solution- Set up a single store with various functionalities. Setting up a single store for international selling requires you to automate many aspects of your store. Following article discusses all the issues that are right now being solved with working on multiple stores and how our app lets you solve these challenges with your single existing store. Setting up a global online store or expanding your local store to global horizons is not an easy task. You sell products at reasonable rates. You give discounts. You arrange for sales. Maybe people all around the world visit your online store too. Yet, something is there that drives them away. In short, abandoned cart orders have been increasing since your international business. People come, add products to their cart but leave without buying. So, what is it that results into these abandoned carts? Well, working on something with 80% failure rate, you have to play your cards carefully. Let me tell you my experience. There was this bag I liked and wanted to buy. I had been searching for a similar bag everywhere around me and online. Once I found it at a website, I was ready to buy it. And when I saw its price, my happiness knew no bounds. It was on a wholesale website for $10. I headed to checkout. While checking out, final price of $28 shocked me. I closed that site without buying. $18 for shipping or other hidden prices just killed my gist to buy it. I wanted to buy that bag and was ready to pay almost any price on that website. I expected it to be of higher price because this online store was located outside my country. But, paying so much money for shipping made me close that website all together. Now, I am not saying this is the case with all the people shopping globally. Still, your goal is to keep buyer away from the feeling that his money is being spent unworthily. You cannot remove shipping charges for obvious reasons. What you can do is: Set prices in a way that shipping amount gets included in the actual price of the product. It is very evident that shipping charges are going to vary with countries, products and delivery methods. So, including fixed shipping rate in the selling price of a product for all the countries is not going to work. There has to be a solution to this problem! What if you could set different prices for multiple countries? I mean different prices of the same product! However, it seems like you would have to do a lot of work. The only existing solution to this kind of problem is to set up different stores. We at MLveda have taken care of this concern. With our Multi Country Pricing app, you can easily accomplish the goal of setting and managing variable prices under your single store. Do you feel there is a connection between tax charges being added at checkout and people leaving without buying? Research shows that number of customers drop by 30% after ‘Checkout’ phase. Taxes get added at this phase. A number of times I have come across people in various discussion forums. These people take their feelings about ‘additional charges’ to chat rooms and social media platforms. Nowadays buyers don’t want to get out of roof and they also don’t want to see prices getting converted from $35 to $60 as they proceed to checkout. When it comes to their money, people generally want to know where and how it is spent. Following snippet may give you a clearer idea of one confused customer’s side. What is the deal with sales taxes for online purchases? I live in New York City and I shop online constantly. I know that when I buy things on Amazon I pay tax, but on some sites, I don’t. Also, my sister who lives in Chicago does not pay any sales tax when she orders stuff online, even when she orders from Amazon. What gives? I’m so confused. Also, I heard the laws may be changing on this. Can you please explain what’s happening? Managing taxes and keeping the payment system transparent for the customers is a tricky business. Tax configurations have always left people so confused that CNET also mentioned and discussed various aspects of this criterion in their article ‘Confused about online sales taxes? You’re not alone’. Tax configuration is a country specific domain. Various countries collect different forms of Sales Tax. For example, countries in UK charge VAT (Value Added Taxes). Now one solution is you arrange for product prices such that they are tax inclusive. Moreover, these tax inclusive prices should be for the products inside that country only. 1. You could set price as €100 and collect tax of €18 at checkout. If you go for first choice, then your customer may feel confused and it is possible he goes without buying. Because customers don’t like their money going in anything other than the actual price of the product. 2. You could include tax in original price and set price at €118. If you go for second choice, then consider the following scenario. You could set up multiple stores so that you can set different prices for various countries. Or, You could set different prices of the same product at your single store. First choice is what store owners these days have to follow. However, it is a very tedious job to manage multiple stores. So why not go for the second choice with our Multi Country Pricing app. Multi Country Pricing app lets you configure taxes for various countries and arrange tax inclusive prices for specific countries. How to manage sales of products that are banned in some countries and not banned in others? There are many such scenarios where you need to face this concern. Suppose you own a global grocery store. Don’t be surprised! Many grocery items do pretty well in international markets. Many countries produce very specific edible items. Some of these items can go for days without being stale. So, you can sell these items across borders. But, everything changes when you sell globally. You face challenges that you couldn’t have imagined with your local store. Poppy seeds are banned in many countries like UAE, USA. Your store sells these because they are not banned everywhere. If anyone in USA tries to order poppy seeds, they can get it from your store. Now, don’t even get me started on all the legal allegations these countries may conduct on you. You can either stop selling such legally sensitive products on your website. This is going to incur you some or even, a lot of loss. Or, you can set inventories country-wise. By setting country-specific inventories, anyone living in USA or UAE will see ‘Sold Out’ or ‘ Out of Stock’ for poppy seeds. Basically, they won’t be able to order the items you don’t want to sell them. As is the case with all the above discussions, for this setting to work, you need to setup multiple stores. We have already discussed various aspects and challenges of working on multiple stores. Worry no more! 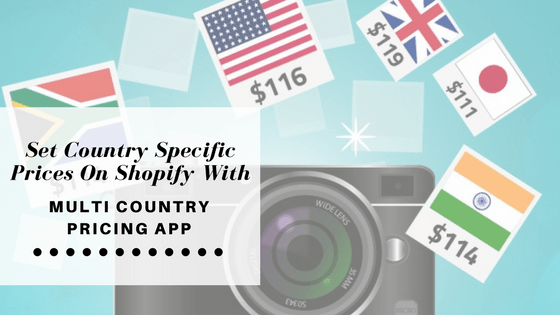 Our Multi Country Pricing App lets you set country specific inventories within your single store. With our app, you can work on your single store and sell products to countries as per your wish. If you are selling globally, you are familiar with setting up different warehouses for various countries. It only makes sense that you supply products to buyers from warehouse, which is located nearer to them. For example, if a buyer wants a product to be delivered to Canada, then your store should facilitate the dispatch from warehouse in Canada. 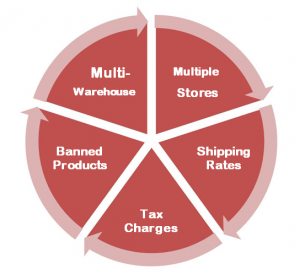 Managing stocks of these dynamically working warehouses on your single store is a tough task. By considering buyer’s location you need to automate the system in such a way that the order dispatches product from the nearest warehouse available. Multi Country Pricing lets you automate your store. So, you could work dynamically and see updates in real time with multi-warehouse setup. Providing dispatch from proper warehouse is the simplest application of the logic we are talking about. Inventory Management is also a concern. Suzaan wants 40 pairs of Levi’s jeans to be delivered to Canada. 30 of these pairs are available at Canada’s warehouse. 10 such pairs are available somewhere in US. It is not feasible to get 10 pairs delivered from US because of following two reasons. Why complicate the matter when there is a very simple solution available? The simple solution is to use Multi Country Pricing App. With this app, you will be able to set warehouse limitation for various countries as per the availability of products in warehouses there. With this, you could be able to save you from the loss of delivering products to faraway places and make it profitable for customer as well as your store. Our ultimate goal- Your Profit! ‘Different prices for same product’ is a deal you want to invest in. Because this gives you freedom of deciding profit margin and how much revenue you want to collect country-wise. Moreover, solution of all the problems discussed with single store and with a single app is in itself a game changer for your business. Our app is one stop solution for all the problems you might be facing. It’s simple. It’s affordable. It’s something you necessarily need for your global business to grow. Hi there, just turned into informed of your website via Yahoo, found that it can be quite interesting. I am gonna be watchful for brussels. I may be thankful any time you continue this in the future. Many people is likely to be benefited from your posting. Many thanks! Very interesting. I feel you made helpful and valid points from this writing. I agree with you completely and am thankful I had an opportunity to read this.